Solid Color, Weighted Blanket, Yellow Tie Dye, Up to Twin Size 3 to 20 Pounds, Calming, Heavy Blanket, SPD, Autism, Weighted Blanket. SOLID COLOR Weighted Blanket. 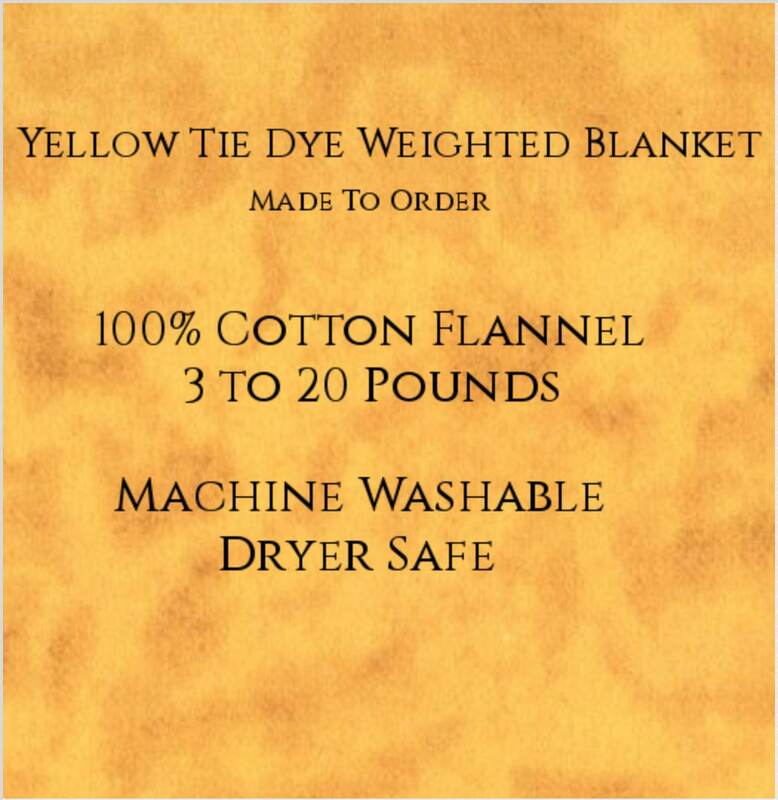 This listing is for a Yellow Tie Dye Blanket. If you wish to have a different color backing please contact prior to purchasing to ensure there is enough fabric in the color you want the backing fabric to be. Please note that all pictures were taken with natural light. Color representation on your computer screen may be different than actual fabric color. Color may vary slightly upon delivery then what is pictured in listing. This is double brushed, 100% cotton flannel. It's machine washable and dryer safe. Quilt Shop Quality Fabric. Flannel is used to provide a softer alternative than woven 100% cotton fabric. It's breathable and easy to care for. We use high quality, extra dense, non toxic, plastic polyethylene pellets to weight your new blanket. This allows your blanket to be machine washable and dryer safe. Blanket will be MADE TO ORDER just for you.